Project Life: Week 2 | I am JuJu! I just have to say that I have really been enjoying this project! It is so doable! My favorite part is that I have the first 2 weeks of 2012 documented. This week I had a great mix of pictures, ephemera (collectable tidbits) and journaling. Below is the picture of what you see when you open my album to this week. I added a 9-pocket page protector (baseball card holder) in the middle to hold all the polaroids I took on our trip to New Mexico. The picture above is the left page of the layout. I love that I only have 2 pictures here, but all the other little stuff really tells about our week. I downloaded the Mission Impossible picture and attached the movie tickets from when I took Becca and Skylar to see it. I also added a piece of the church bulletin from Sagebrush as well as part of my score sheet from playing bunco. The statement “I love you my friend” is one of those digital overlays that I mentioned above. It is part of this set that I bought from Designer Digitals. It was designed by Ali. The picture isn’t the greatest as there is a bad glare, but I don’t have many pictures with my friend Joyell and I was determined to use it. I truly love Joyell, she was Skylar’s teacher in the 5th grade, but she and I became friends the year before. She has such a heart for kids, especially those with special needs. I am beyond blessed to call her my friend. The journaling card in the middle of the page titled “This Week” is also a digital download that came from Paislee Press. You can see the complete set here. I love all the possibilities these printable cards give me. I’m excited to pick up the new 4×6 cards they just came out with. 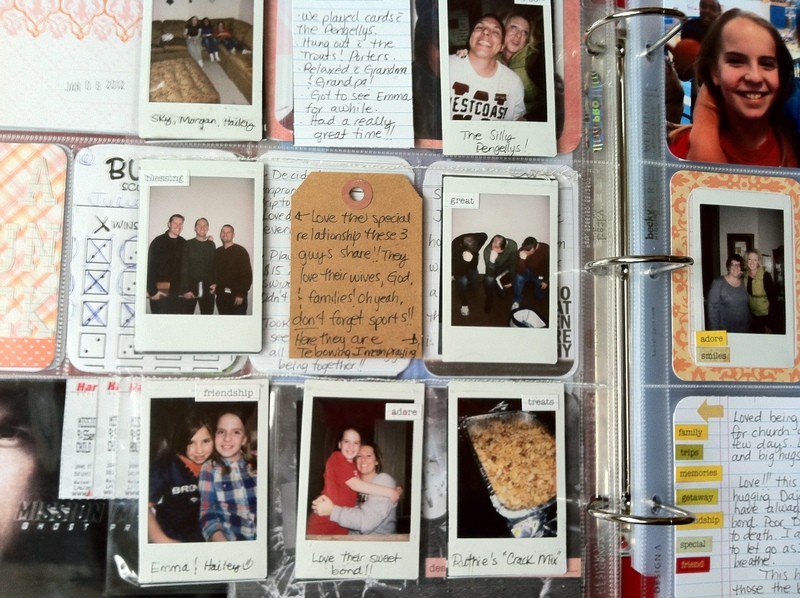 The picture above is a close-up shot of the 9-pocket page protector that I put all the polaroids in. I loved telling the story of our weekend through polaroids. Below is the picture of the backside. I sewed the tops of the protector together as the pictures kept sliding out. Don’t look too closely as I definitely don’t have “mad sewing skills”. My machine is actually pretty jacked right now so I was just happy to get a line (not even really straight) sewn. Above is the right side of my layout. I loved using the word stickers all down the side of my journaling card as well as on my polaroids. I also used another digital overlay on the picture of Skylar with Joyell’s son. Those 2 have such a sweet bond and are always thrilled to see one another. This was Skylar saying “Goodbye”. It was definitely one of my favorite moments from the trip. So glad I had my iPhone camera to capture it. The “Favorite Moment” saying comes from this set also designed by Ali Edwards. This entry was tagged designer digitals, giveaway, project life week 2. Bookmark the permalink. Hey Julie … super proud of you for keeping up and I enjoy reading about your life! Like I said I am on Year 3 and I love Project Life. I don’t get as fancy as you … but I really enjoy it! And now I just remembered that I forgot to take a picture tonight at the party I was at … darn it! Don’t think I can fudge that one! I learned about Digital Overlays from my One Little Word Class with Ali Edwards … very fun!!! This is great. It brought tears to my eyes. I love you so much!!! You keep on amazing me!! What a fun giveaway!!! I love Ali’s stuff. Count me in!! 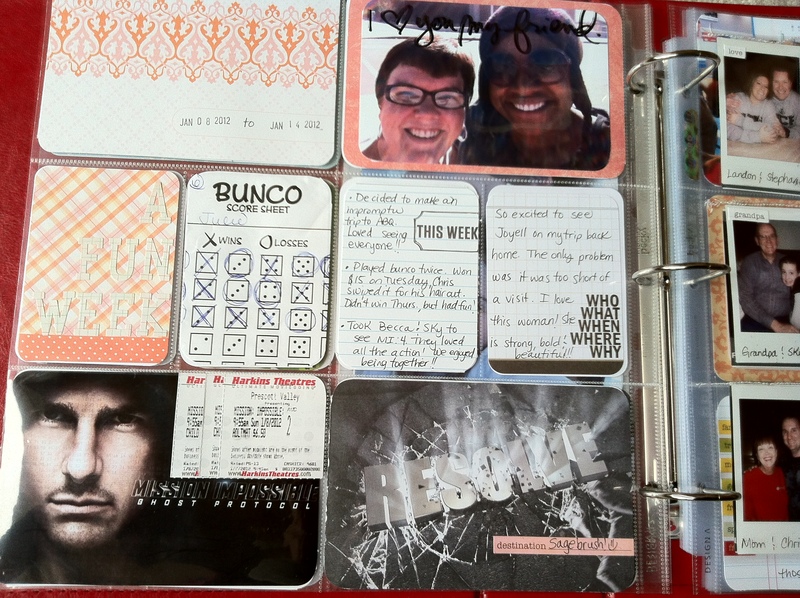 I love your project life layouts, thanks for sharing. I’ve just started trying to use digital overlays and I’d love to win! Thanks. Julie, I am reading your ‘back issues’ now. The polaroid weekend looks great. I recently saw a post somewhere a post about using the 2×2 coin pages that coin collectors use for Instagram pics. Will be buying some of those on payday. I’d like some more digital overlays – have recently taught myself to use them – Ali is my fave too. 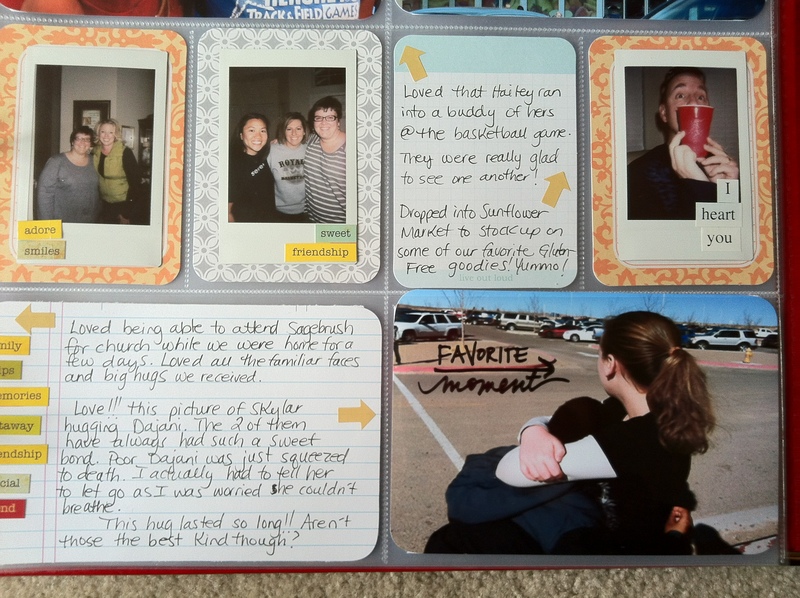 I have a Instax that I need to use too… your page is a great reminder to use it and the baseball card sleeves I have. Thank so much!! I’m just starting to dabble in overlays myself, thanks to ali. Awesome giveaway! I wish I had hand writing like Ali Edwards…. i just ordered my project life kit yesterday and found your blog when looking for some inspiration! love your layouts! Thanks for the chance to win a Designer Digitals gift certificate! Love their shop, especially their Ali and Cathy Z stuff! I’m wanting to get Ali’s everyday photo brushes and stamps and Cathy’s tiny templates! Great inspiration, thank you. I too wish I had handwriting like Ali!! 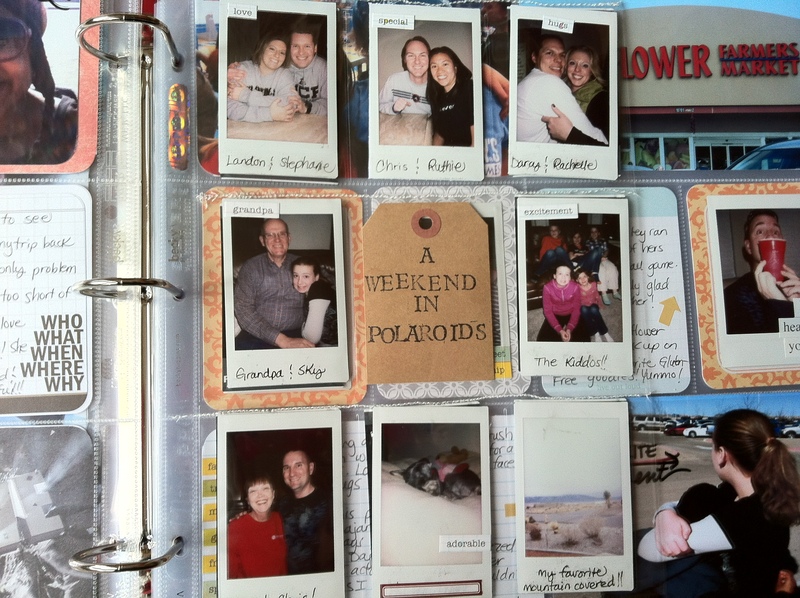 Love your “weekend in polaroids” insert. I have a Fujifilm instax; I will have to try that this weekend. Thanks for the inspiration and the chance to win. BTW, I am so glad I came across your blog. My youngest was diagnosed with Autism in December, and we know we have a long road ahead; there is so much to learn. I’m a newbie to digital stuff, too! Would love the chance to try some of this stuff out! your pages are very cute! Love the layouts. Thanks for the inspiration! 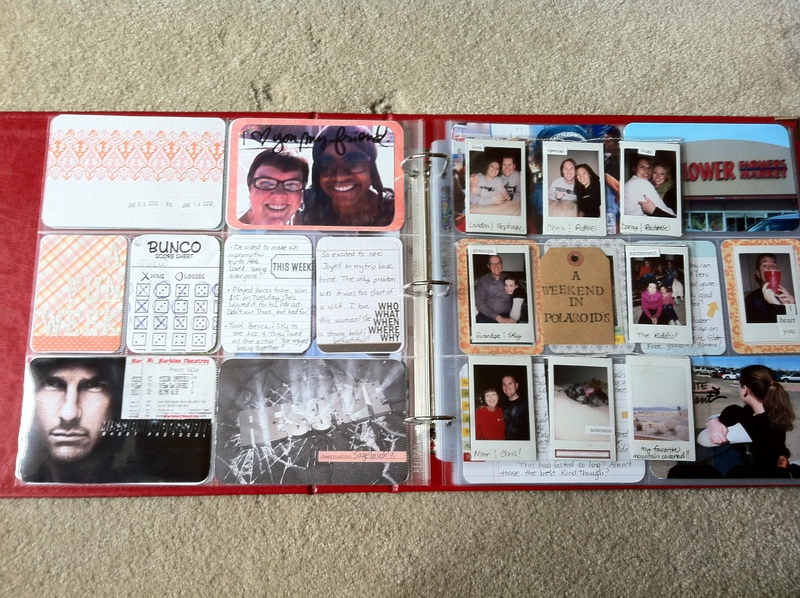 I’m soooo very new to the world of hybrid / digital scrapbooking. I’m loving all the tips and tricks I’ve learned from blogs, Vimeo tutorials, and all the inspiring goodies at Designer Digitals. I would love get some goodies from Designer Digitals to get me rolling along on some serious Project Life goodness!